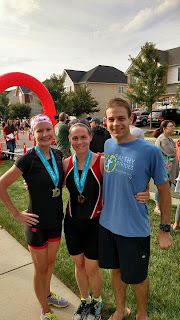 The South Riding Triathlon has always been an "A" race for me. I've done it every year since 2011 and I use it as a measuring stick to see how far I've progressed. I know every turn of every part of this race by heart. In fact, according to Strava, I have run the run portion of the Tri 100 times. And because of that, I felt pretty nonchalant in the days leading up to the race. It almost seamed like I didn't even realize it was on my calendar. The Thursday before the Sunday race, I thought maybe I should taper a bit so I cut back the intensity of my workouts, watching Moana during my Thursday trainer ride, doing an easy 5 miles on Friday morning, and then a stretch-out hour swim on Saturday. The day before the race is when I started to get my pre-race jitters. That day, in addition to all of the normal race prep stuff I needed to do, I also had to drop Ellie off at her grandparents' house. They are always gracious and willing to help which is amazing. Ellie has such a good relationship with them, I don't think she even realized that we left. I wasn't sure how I would do going into the race. My time last year of 1:03 was pretty good and it continued the trend of improving every year. 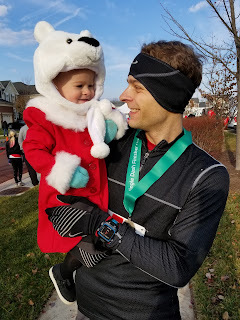 Based on my volume of training, I should have improved this year as well, but since I wasn't following any training plans and hadn't done any races recently, I had no clue where I would actually land. My stretch goal was sub-60. Jenny thought I would get sub 1:01, I would have been happy with better than last year. Spoiler alert, as always, Jenny was right. My time was 1:00.53 (according to my watch). My swim started off a bit shaky. 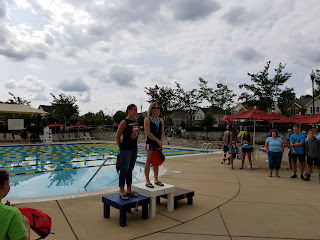 During the packet pickup and bike inspection the previous day, I realized that I was about 18 spots behind a friend of mine that was also doing the race, despite the fact that I had a swim time 15 seconds faster than her. The ordering is super important since the swim is done in a pool, snake style (swim up one side of the lane, down the other side of the lane, then go under the lane line and do it all over again). Participants are spaced out 15 seconds apart, so as long as you are pretty close to your swim time, the person behind you won't catch you and the person in front of you won't get in your way. The issue is when people guess their times and then there are all sorts of issues. To prevent that exact thing from happening, the organizers require a verified swim time. Either done at one of their time trials or from a previous race. They essentially don't care what you put for your estimated time when you sign up for the race. 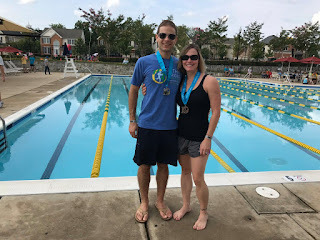 And that was the case for me - I swam 7:33 last year, and since I didn't go to a time trial and didn't email them to let them know that I had a verified time, my 7:20 spot was gone. 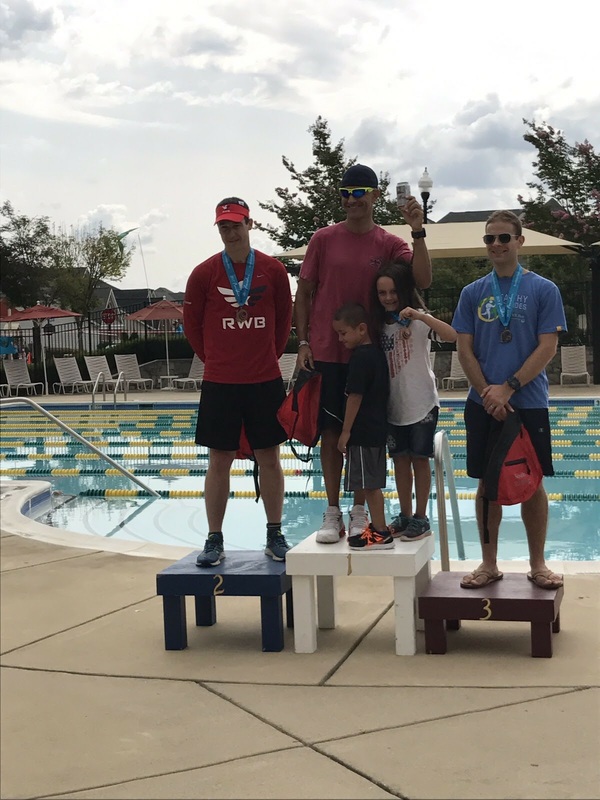 I was a little bummed, but at the same time I always swim the races slower than what I do in practice, so I wasn't terribly upset. Plus I knew nobody would pass me, which was great. I jumped in the water and immediately my arm-based heart rate monitor came un-Velcroed. I grabbed it with my right hand as I was swimming and tried to see if there was a way I could put it in my tri suit pocket, but I thought better of it and just tossed it out of the pool once I hit the first wall. I was annoyed that I wouldn't have heart rate data during the race - not that it would impact anything necessarily, but I do love looking at my races after the fact. 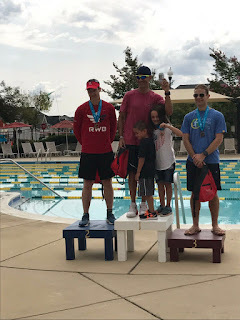 I ended up passing the guy in front of me (the eventual first place winner) and finished the swim with a time of 7:24, so slower than my estimated time, but still a big improvement from last year. The transition went pretty well - I've gotten pretty good at doing a running mount, and I don't waste time putting socks on. My biggest hurdle is apparently getting my race belt on, and on top of that, I had trouble getting my helmet clipped as well. All things said, my T1 was within 2 seconds of last year. The bike portion went well. The time spent on the trainer has definitely paid off. I only got passed by one person (the eventual winner that I passed on the swim) and passed scores of other people. There were a lot of teenagers and people on non-road bikes. The bike was non eventful, which is the best kid of bike ride. I took off about a minute from my time last year and did the ~12 mile course in 32:50. T2 was also good and I somehow managed to clock myself within 1/10th of a second of what I did last year, so I'd say that's pretty consistent. I do run with socks, even though it's only a 5k*, so I feel pretty good about the 47 seconds for that transition. While coming into T2, I try to go high cadence to shake my legs out before the run. I don't know if it does anything, but my legs never really felt right on the run and I never really caught my breath. The reason for both is pretty obvious - it's because I did the run in ~6:20 pace. I never had a chance to catch my breath because I never ran slow enough to recover. My legs may have felt a bit janky, but my cadence was right where I wanted it to be, so in all the run went great. The course is only 2.9 miles, so my time was 18:43. I showered after I crossed the finish line using the pool showers (I don't know why this was the first year I've done that!). Then I met up with my friends who were spectating and waited for my friend with the lower swim seed to finish. She brought it home and the spectators went home while the participants went to the best part of the tri - the breakfast buffet including mimosas. At some point during breakfast they posted the unofficial results and I saw my time, which of course matched my watch, but I also saw that the guy directly in front of me won for the men (he actually didn't win overall - a 15 year old girl had the best time of both sexes). I then saw my name right below his, which was awesome. I then looked up (the girls are listed above the men) and saw that Jenny was fifth overall for women and first in her age group. She set a PR by almost four minutes. At that point, we couldn't not stay for the awards, though they didn't start for another couple of hours. They don't do the awards until everybody has completed the race and the last participant was just getting out of the pool to start the bike as I was walking in to shower. I was filled with pride as I saw my wife up on the podium collecting her award. I just wish Ellie was there to either join her or cheer her on. I would be lying if I said I was anything other than disappointed when I heard my name called first for the overall awards. Apparently somebody had beaten me by five seconds officially, but not shown up on the unofficial results. It really spoiled the moment for me. I was super happy with my time, and I would have been ecstatic to place third overall, but to think that I was second, only to have the carpet pulled from under me really changed my perception. Don't worry, by the time Jenny and I were walking back to the car I was over myself and thinking about how I was going to improve my time even more next year. My wife had the great news to share with my several months ago that one of her good high school friends got engaged to be married and was going to have a bachelorette party. 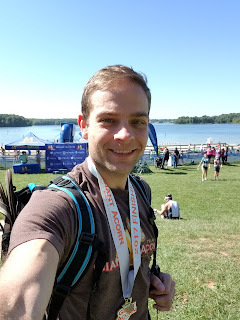 The only problem was that it was an out of town party and it was on the same day as the Giant Acorn triathlon that I had done the past two years. I told her it wouldn't be an issue since I had apparently forgotten to sign up, or at least I couldn't find my registration confirmation for the race, and now that she had plans, I just wouldn't sign up. Today I ran in the annual Jingle Bell Dash (formerly the Jingle Dash). It's a community event that is a 5k course with two loops for people who want to do a 10k. Typically there only a handful of 10k runners and a (relatively) large number of 5k runners. I've done this race every year since 2013 and I've come in first place three out of those five times (I was second in 2015 and 18th in 2013. It sounds more impressive than it is. Don't get me wrong, I'm proud of my performance. I broke 40 minutes in the 10k for the first time in this race. However, with the field for the 10k only being about 30 deep, it is not exactly elite competition. Last year, Nike hosted a big publicity stunt to try to get the first human ever to run 26.2 miles in sub-2 hours. It didn't work, despite all of the advantages given to the runner. I'm sure that one day, somebody out there will break achieve that goal and a 2-hour marathon will be like a 4-minute mile - something extremely difficult to do, but doable.